Choose your required service below to check if you are in our coverage area. Your order will be delivered between 1-3 days. 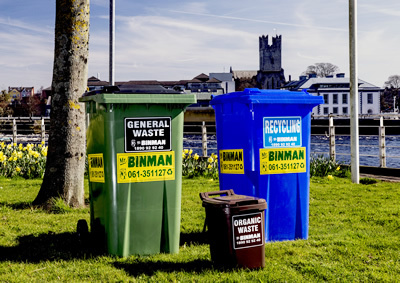 If you require a skip within 72 hours, please call our office on 061-359000 or click here to fill in our enquiry form and a member of our team will give you a call. The details you have provided, including your email address/mobile number, may be used to keep you informed about future products / services / events we would promote directly or through carefully selected third parties. If you wish to receive such information please tick the box. 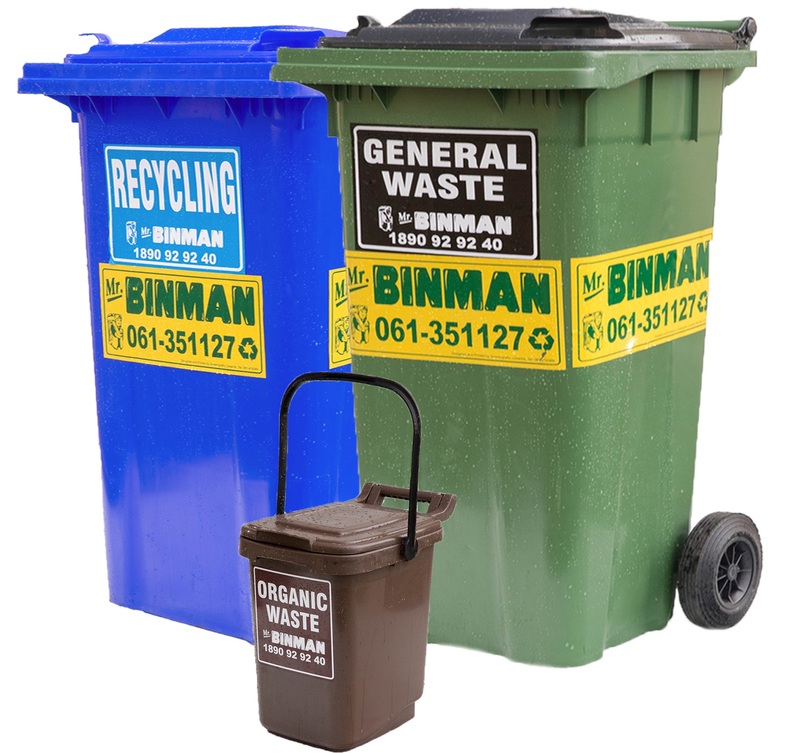 A minimum credit of €8.00 must be on the account before presenting your wheelie bins for collection. Collections are on alternate weeks. We will post you a calendar to advise when you can leave them out. 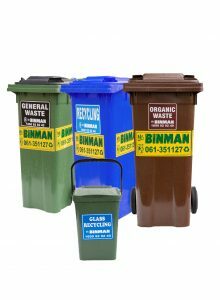 Bins are only charged when they are left out and lifted. The service charge is charged every month regardless of how many collections were made. 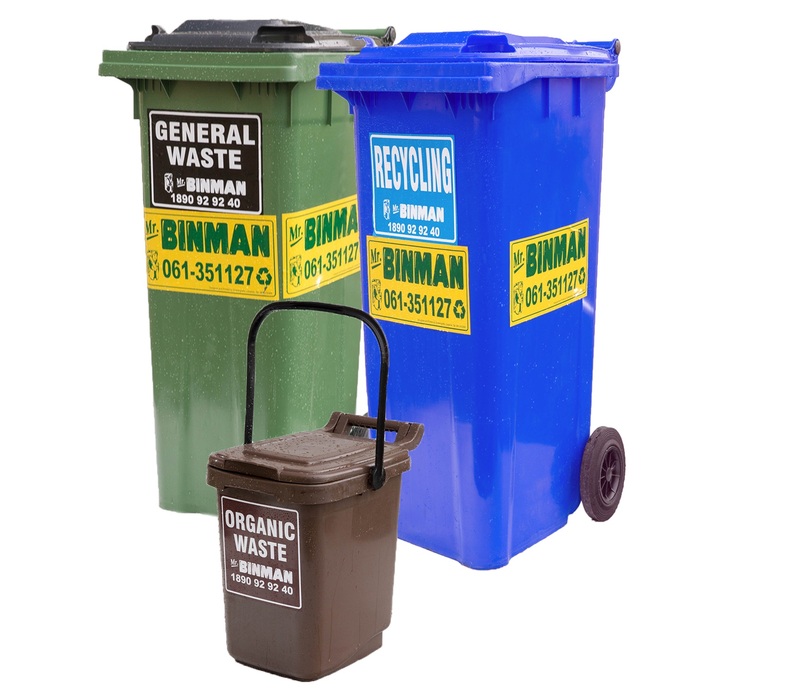 We charge customers €184.87 per 6 months which is €30.81 per month. The discount we give new customers is deducted from this to €27 per month. 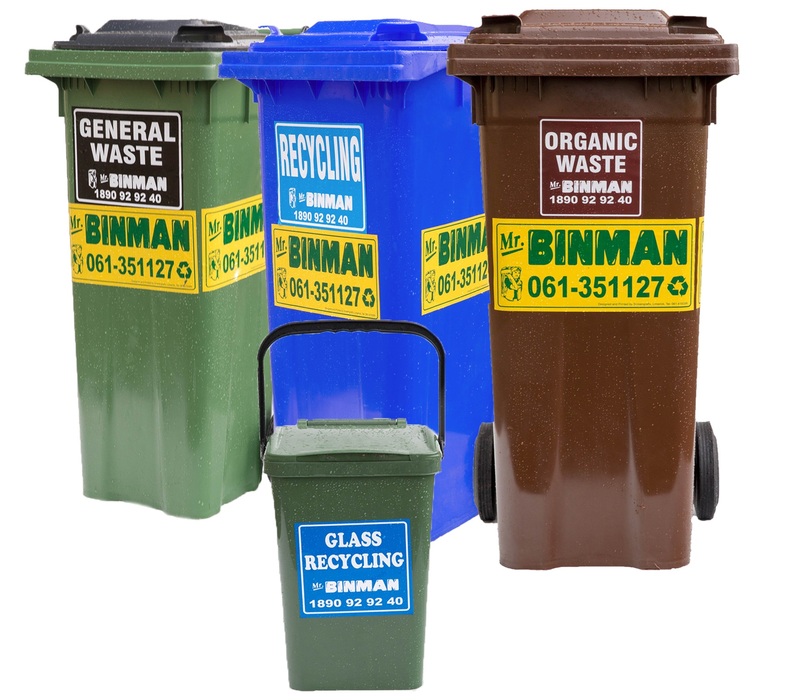 Bin Price: €27 per month x 6 months that increases to €30.81 per month after 6 months. The bins are collected on alternate weeks on a schedule set out by Mr Binman. 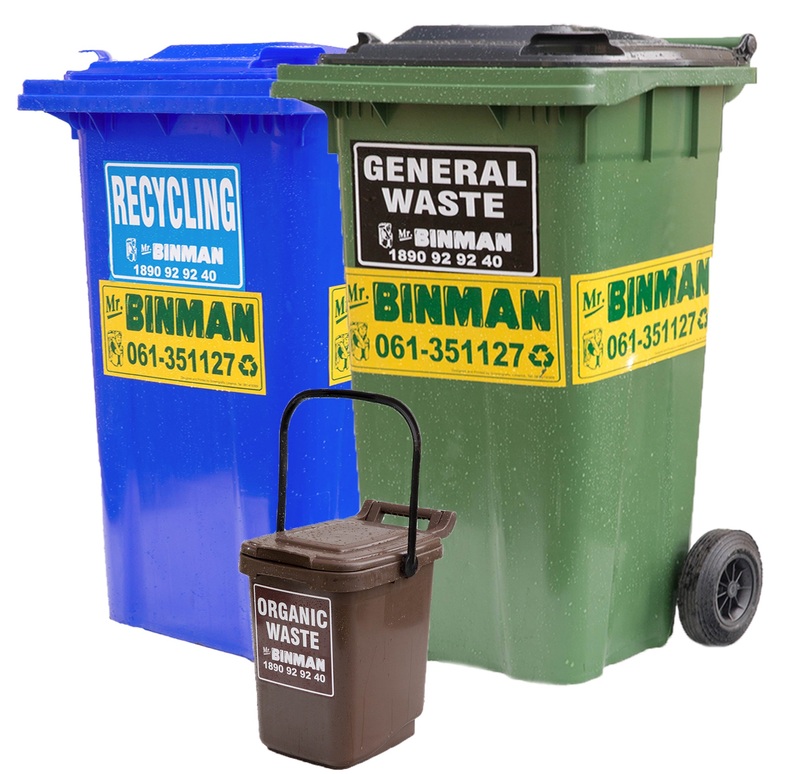 Week 1 = Waste & Organic and Week 2 = Recycling and Glass. Free Complimentary Text Reminders for collections and payments. 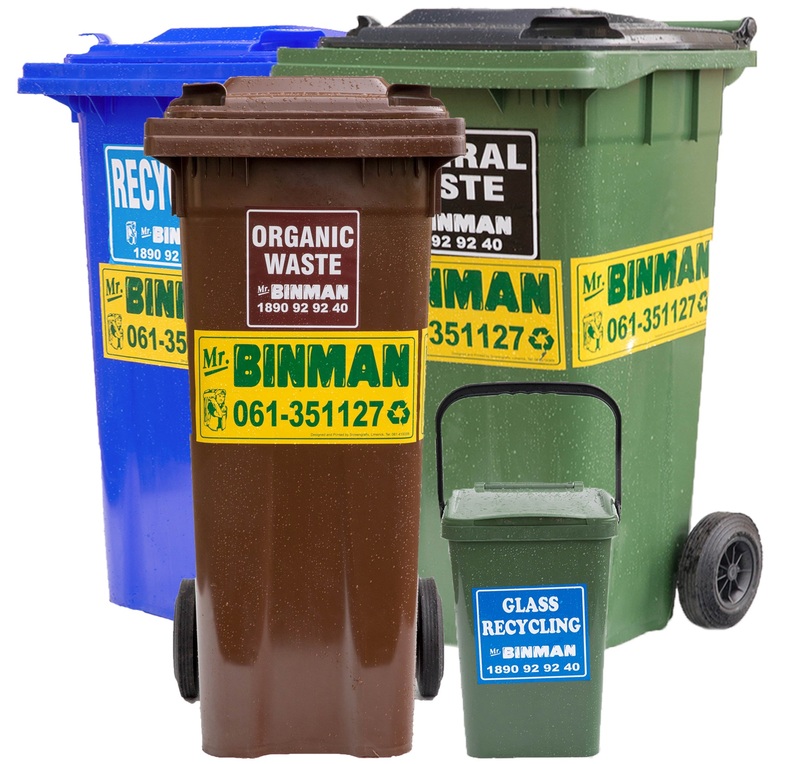 After you have signed-up, you will get a welcome call from a member of the Mr. Binman team. 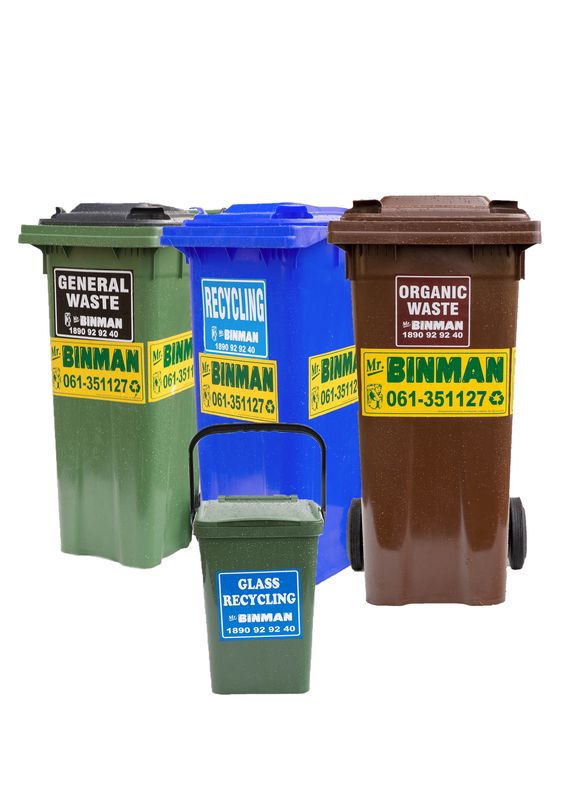 On the call we will advise you of your collection days. 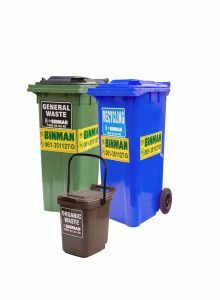 Standard Household has a weight limit of 300kgs per 6 months and customers are incentivised to reduce their general waste to get money back. 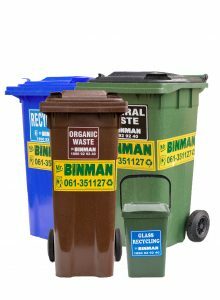 Bin Price; €27 per month x 6 months that increases to €30.81 per month after 6 months. 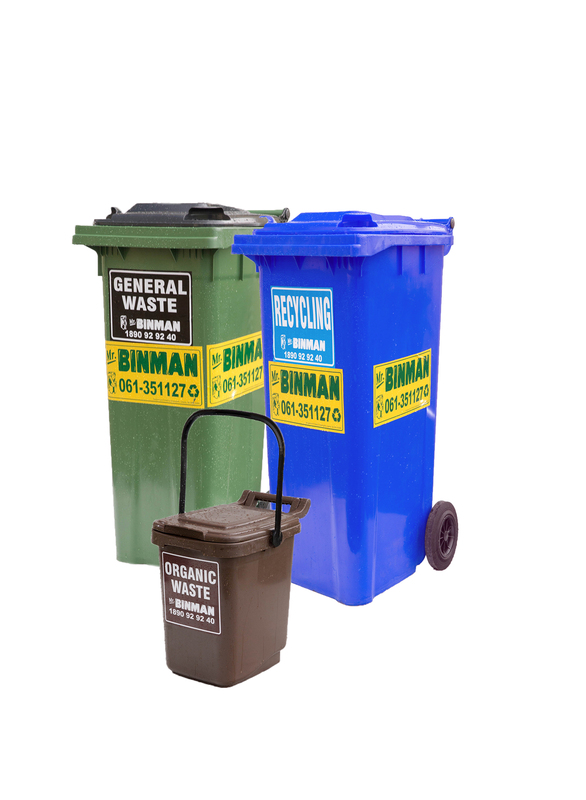 All bins are collected fortnightly on a schedule set out by Mr Binman. 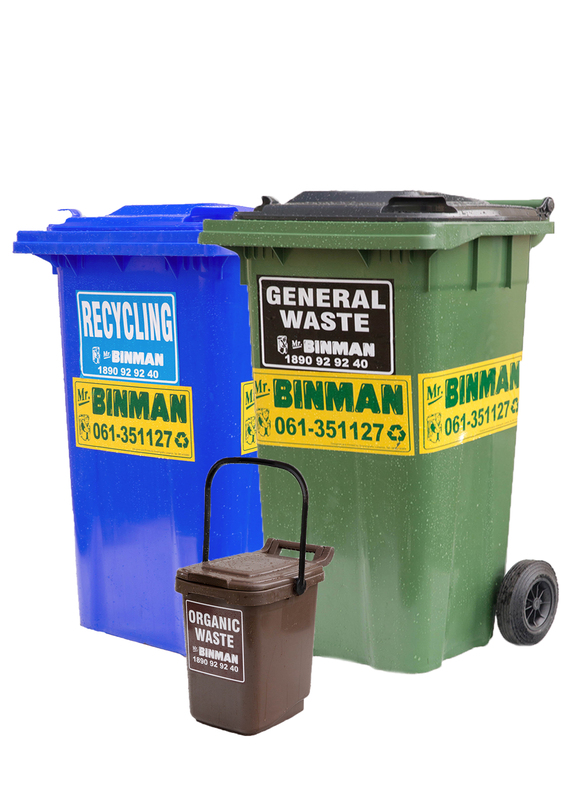 After you have signed-up, you will get a welcome call from a member of the Mr. Binman team. 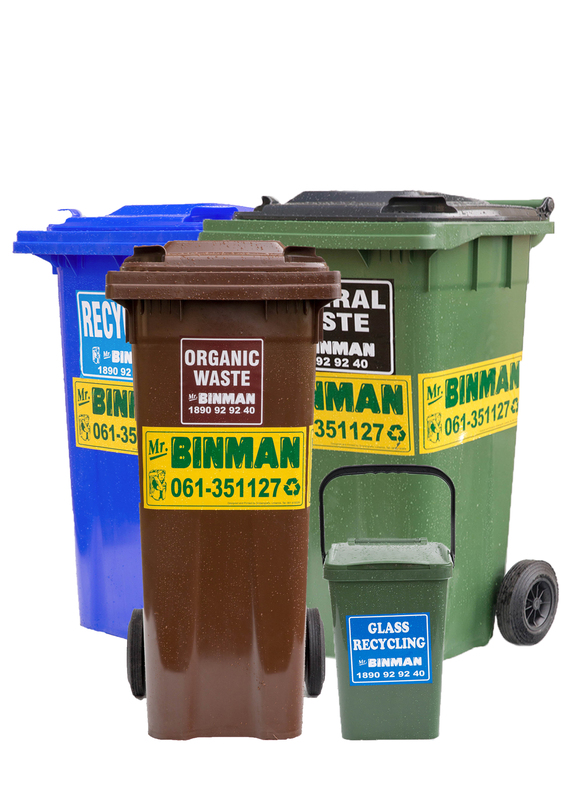 On the call we will advise you of your collection day. 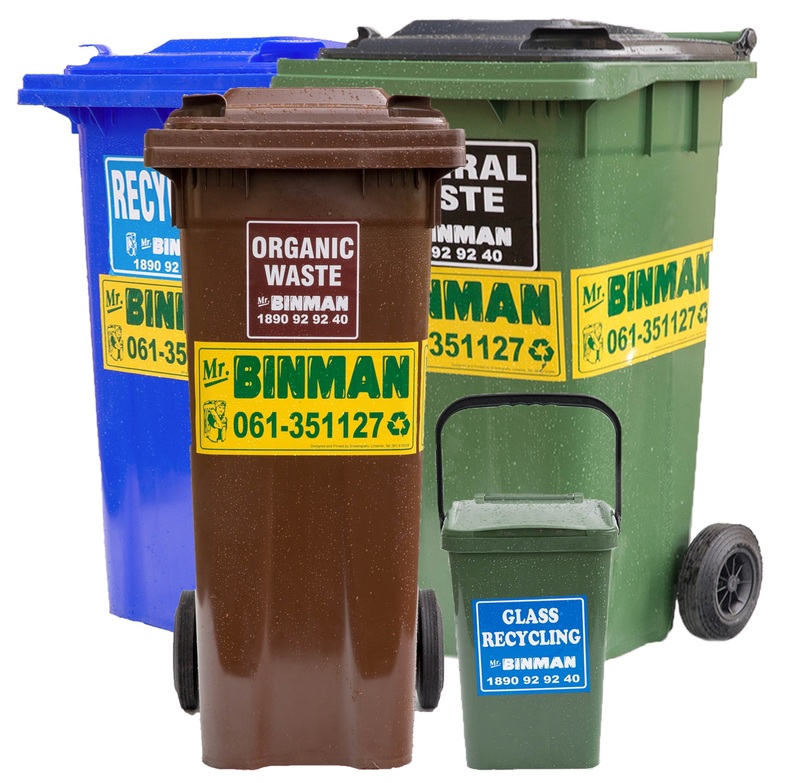 A minimum credit of €13.00 must be on the account before presenting your wheelie bins for collection.